The Nokia X2-02 is a S40 6th edition device. The Active standby is the trademark homescreen layout. If you've ever used a Nokia phone, you should be familiar with it by now. It divides the screen into tiles that can be scrolled with the D-pad and edited as you see fit. They can be rearranged but the default layout makes sense. The general indicators are on top, featuring date, time and missed events. Pressing the end key while the keypad is locked displays a lockscreen showing the time and date. The main menu can be viewed in the traditional Grid, List or Single view modes. The left button is assigned to the Go To function by default, which brings up a list of shortcuts (you can choose which ones go up there), so that accessing the most common features is easy. Also, as a Series 40 device, the Nokia X2-02 will run Java apps so you can extend the inbuilt functionality. The Java version of Facebook's app is a good place to start. The Nokia X2-02 handles messaging without a problem, though with no fanfare either. The supported formats are SMS, MMS, flash and audio messages and the phone handles email too. The keyboard of the X2-02 will give you reasonable typing speed. It's a good package in terms of software support too, with Nokia Messaging and Nokia Chat enabled. The email client works with POP3, SMTP, and IMAP4 and multiple email accounts are supported. There's support for SSL too, which enables it to handle a Gmail account for example. As for the regular Gallery app, it's still here - but it's hidden in the Applications menu. It's quite a capable file manager, especially for a feature phone. It can manage folders and files - both one by one and in bulk. The music player of the Nokia X2-02 has a solid set of features including a fair number of supported formats. The player handles MP3, WMA, WAV and eAAC+. Tracks can be filtered by artist, album and genre. Naturally, the A2DP profile is supported, allowing Bluetooth streaming of stereo sound. There're five equalizer presets and two slots available for custom user settings. 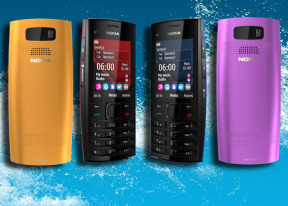 An RDS-enabled FM radio is available on the Nokia X2-02 as well and it can play through the powerful loudspeaker. Thanks to the built-on FM antenna, you can start the app almost instantly with just one key stroke (the media control on the left side of the phone). The FM radio starts playing immediately. There is an FM transmitter as well. You can configure the music player to broadcast on a pre-defined frequency and get your music playing in your car cable-free. For the record, the Nokia X2-02 supports MP4, H.264, H.263 and 3GP. Let's face it, watching a movie on this small low-res display is not exactly pleasurable but will work. Playing the occasional clip someone sent you via MMS is as much use as this player might be getting. The Nokia X2-02 comes with the familiar Nokia web browser. Its start screen has the usual URL and search bars and three side-scrollable panes below, which are quite reminiscent of the Symbian homescreen (complete with the three dots at the bottom that indicate the current pane). One excellent new feature is the autosuggestions as you type in the URL - it lists recently visited sites and filters the list as you type. It even offers to save you a few clicks by guessing the ".com" at the end - Symbian^1 users can only wish their browser can do these things. The browser uses the Opera Mini trick - compressing web pages on a dedicated server before sending them to the phone. Pages load quickly (even on EDGE) and don't waste much data. Image quality is adjustable (Best/Good/Average or No images). The performance is not great by a longshot, but it's a cheap phone so we really can't start criticizing the phone here. The thing works just fine and will do the job most of the time - this is the most important for the X2-02.